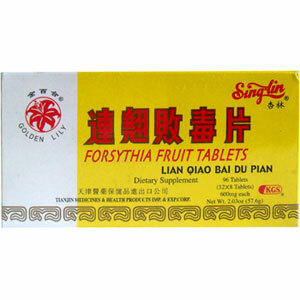 Forsythia Fruit Tablets (Lian Qiao Bai Du Pian) supports the health of the skin, the gastrointestinal, circulatory, and immune systems and the sensory nerves. Tianjin Medicines & Health Products Imp. & Exp. Corp.
Clear Heat, reduce inflammation, eliminate swelling, relieve pain. Carbuncles where the skin is red, but not yet erupted, pain and/or pus is present. Skin infections or any kind of skin inflammation, including boils, Poison Ivy, eruption of skin, itchy skin caused by allergies, psoriasis, etc. Do not use if you are pregnant or nursing. While taking this formula, do not eat greasy, spicy foods.